With the latest ultra HD TVs, you can boost your visual experience while watching, but what about the sound? As with thinner models, speakers are not powerful enough. What if you carve for a better sound experience with high-definition visuals? You don’t have to worry anymore as soundbars offer you the quality of sound that can help you turn your living or entertainment room into a small cinema, at least concerning sound. It is even better if you have a soundbar from a brand like Samsung, a global giant when it comes to high-quality digital and electronic devices. For those who don’t want to compromise on anything less than the best, we have reviewed a popular soundbar from Samsung. We usually start our reviews with the brand first, but there is not much to say about Samsung as it is already a well-known brand. You can’t expect a low-quality product from a brand like Samsung, as is the case with Samsung HW-J355. The HW-J355 is a minimalist, compact device that is designed with only one purpose, which is to boost the sound of your TV or other devices. The soundbar features four tweeters to produce a powerful sound, and to provide you with even better sound, it comes with a wired 5.25-inch subwoofer. If your TV comes with Bluetooth connectivity, you can connect the HW-J355 wirelessly. This also allows you to connect it to a wide range of Bluetooth-enabled devices like smartphones, tablets, and computers. You can simply connect it with your digital device and start streaming music. Apart from Bluetooth, you have other multiple options to connect it to your TV or other devices that include an optical cable, a USB cable, and the TV Sound Connect, which is specific for Samsung TVs. This soundbar comes in a wall mounted design which makes it easier to connect and mount. Even though it comes in a basic design, it is a smart high-tech soundbar with plenty of bonus features that you might not find on other soundbars. For example, it uses 3D Sound Plus technology that makes you feel the sound is coming from all directions instead of one direction. It also uses state-of-the-art technology to offer you the best and clear voice, making sure you don’t miss any dialogues under the influence of background music. The tech also makes sure it separates human voice and renders it precisely. The Samsung HW-J355 Wired Audio Soundbar comes with a remote control that allows you to adjust the sound quality and volume from a reasonable distance. Additionally, you can download and install a Samsung Audio Remote app on your mobile device that will allow you to control this soundbar. The compact yet powerful soundbar by Samsung can surely add life to your living room. For those who are not satisfied with the built-in speakers which are common as TVs are getting thinner and thinner, often sacrificing the power of speaker, the Samsung HW-J355 Wired Audio Soundbar is a perfect solution. The good thing is that the Samsung HW-J355 Wired Audio Soundbar doesn’t occupy a lot of space in your room, as it can be mounted to the wall. However, it does what it promises perfectly, and that is to offer you an excellent sound experience. As expected from Samsung, it uses some advanced technologies to create a sound quality that turns your room into mini-cinema. The 120 watts power is distributed evenly among the subwoofer and the primary soundbar with four tweeters, keeping a perfect balance between the bass and the pitch of the sound. With its smart technology, it is also a good option for those who want to listen to movie dialogues clearly. The best thing is, this one comes at an affordable price since Samsung designed it for common users instead of high-end users. With its multiple connectivity options, connecting it to your devices and setting it up is just a breeze. You can have a lot of good options when it comes to soundbars, as these smart devices are in demand right now. As such, we decided to compare the Samsung HW-J355 Wired Audio Soundbar with another soundbar, which is the DBPOWER Soundbar. Let’s start with the brands. To put it bluntly, DBPOWER is no match for Samsung when it comes to brand recognition. Second, there is also a major difference as the DBPOWER does not come with a dedicated subwoofer. Another major difference is power. The HW-J355 is a 120 watts soundbar, but the DBPOWER is only a 40-watt model. That being said, with its low power, it is significantly more affordable, specifically, almost less than half the price of that of Samsung. In addition, even with less power, the DBPOWER is larger in size. On the other hand, there are some similarities as well, as both offer 2.1 Channel and Bluetooth connectivity along with optical cable connection. They also both come with remote control. Overall, if we compare both products, Samsung HW-J355 is a clear winner here with better sound quality, more advanced features, compact design, and a dedicated subwoofer. DBPOWER can only make sense for you if you are on a budget. 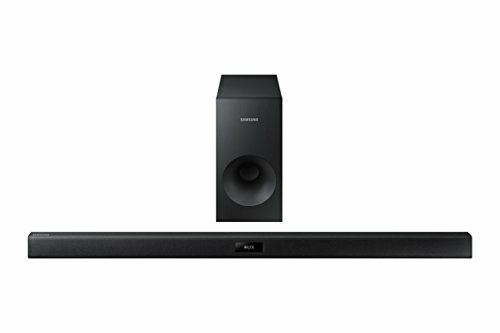 So is the Samsung HW-J355 Wired Audio Soundbar a good option? Yes, it is, by all means. There is truly a reason why it is one of the most popular Samsung soundbars right now. It is not expensive, but it doesn’t sacrifice quality and high-tech smart features. Even though it is an entry-level soundbar, this one punches way above its weight. Not every soundbar within the same price range comes with a dedicated subwoofer, but this one does. Overall, if you are looking for the best value for your money, this product won’t disappoint you.